As I think I’ve said before, regular readers will know I’m not the greatest fan of Bluetooth speakers: too many of them are inexpensive, plasticky and a triumph of some kind of style over function. However, of late I’ve been spending more time listening to desktop audio systems, simply because I’ve been spending more time at my desk in the home office – oh, OK then, the dining room –, and I’ve discovered a growing number of really rather good speakers offering good quality sound without the faff of separate amplifiers and speakers. There’s currently a procession of these little speakers passing across the desktop, from the tiny prototype Frankenspiel FS-X to the very good, and pleasingly retro-modern, Ruark Audio MR1. The latest is the £400 Listen speaker system from Simple Audio, the Glasgow-based company founded by former Linn Products MD Peter Murphy a few years back to market a range of affordable Roomplayer multiroom products. I think it’s fair to say the Roomplayer idea had some fits and starts in the early days, but it’s now well-established, with a Bridge to connect the devices to the home network, and versions of the Roomplayer with and without amplification built-in. The company is also now well-established, having been acquired last year by US-based Corsair, a computer memory and components company with annual revenues of some $500m. Still working out of its offices in Scotland, Simple Audio has expanded its range to include two models of Bluetooth-capable speaker: the Listen I have here is a mains-powered desktop speaker system using a biamplified design, and with USB, line and Bluetooth inputs, plus headphone and subwoofer outputs, while the smaller Go sells for £80, and is a compact all-in-one with rechargeable battery power and even a microphone for hands-free operation with smartphones. The Listen speaker system may follow the usual design of such speakers in that the control and amplification circuitry is all in one speaker, with the other operating as a ‘slave’, but this is a true biamplified and active design, delivering 40W per channel and with a multicore cable carrying separate outputs for each drive unit between the speakers. The drive units themselves are a 25mm silk-dome tweeter and a 7.5cm long-throw woofer in each cabinet, using neodymium magnets, and with a fully digital signal path with DSP to optimise the sound. The system comes complete with everything you’ll need to set it up and use it: there’s an offboard power supply for the speakers, a generous captive lead to connect them on the left speakers, plus a 3m extension cable, and both line-in audio and USB cables. However, what really grabs the attention – apart from the beautifully designed packaging – is the touch-control panel atop the right speaker, giving on/off, volume control and muting, plus Bluetooth switching. The merest touch is required to change settings, and the volume can be adjusted with a swipe of a finger or just a tap at the desired level: it’s a very slick and decidedly classy design, as is the rest of way this system looks. Most connections are hidden round the back – power in, USB and subwoofer outputs – but the line-in and headphone sockets are mounted on of the right speaker’s uprights for easy access. And the Listen system is more compact than you might think from the pictures: each speaker stands just 20cm tall, and takes up minimal desk-space. The sound? 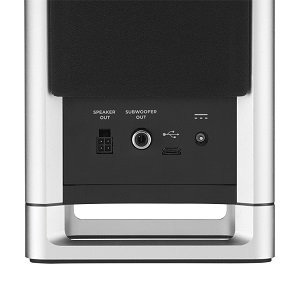 Well, these little speakers deliver so much more than they have any right to: used either side of my monitor they deliver a sound not only tightly-focused in the way it appears to come from between and around the enclosures, rather than from the speakers themselves, but also spacious and with fine soundstaging. Use them with a degree of toe-in and the music ‘snaps in’ in a very acceptable fashion, whether playing music from one of the many high-quality software players or just watching BBC programmes on the iPlayer. The BBC’s recent Good Swan, Bad Swan: Dancing Swan Lake documentary benefited from the clarity and definition of the Listen speakers, with excellent intelligibility and fine power to the music, while some classic 70s rock and pop from BBC Four was delivered with excellent verve and drive, encouraging some fingertip action to push up the volume. Do that and you’ll discover that the Listen speakers can step up to the plate when asked to deliver some serious welly, leading me to move them from the desk into my main listening room and take advantage of both that extension cable between the speakers and the remote control supplied, which also adds play/pause and forward and reverse skip. These are pretty viable speakers for filling small to medium-sized rooms, too, although a bit of help from an active subwoofer might come in handy if you want to attempt some wall-shaking. However, given the size of the Listen speakers, that’s hardly a surprise. Whether on the desktop or on shelves, the Simple Audio speakers have definite appeal, proving that they’re more than just a very slick design, and have the wherewithal to cope as real hi-fi speakers, too. 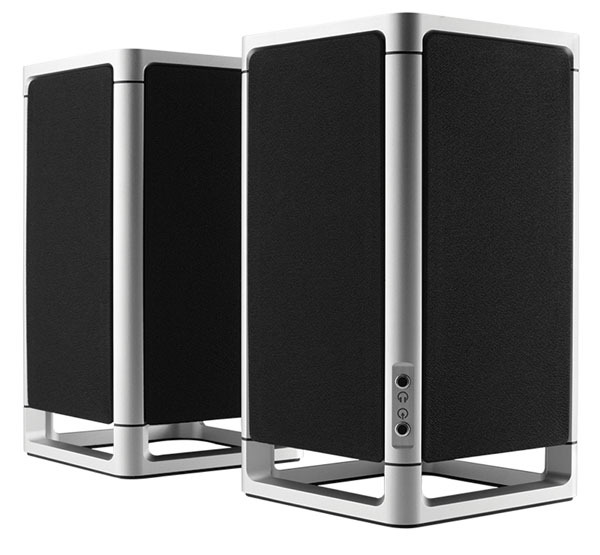 Whatever you may feel about the benefits of small active speakers connected to a computer as opposed to conventional player/amp/speakers systems, the Listen speaker system does prove you can have a system that’s compact, affordable and still capable of a more than acceptable, and for their size exceptional, standard of performance. 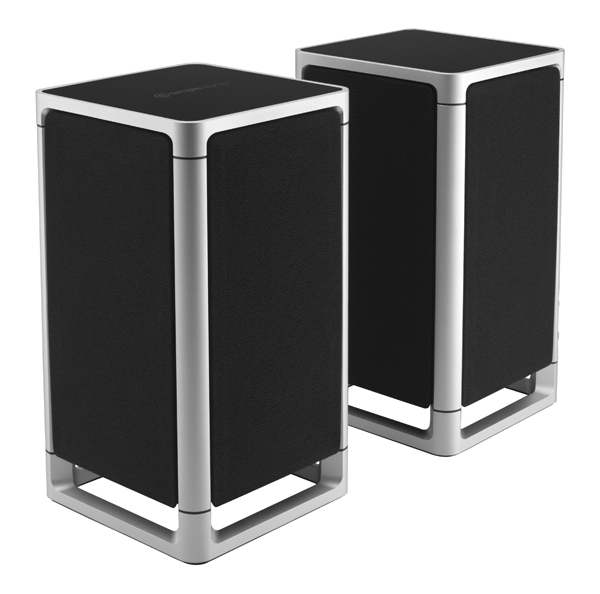 Simply, these speakers make music, and do so with minimal fuss and more than a dash of style, not to mention solidity of build and an overall feeling of quality and solid engineering. They’re really a bit special. I purchased a set of Simple Audio Listen speakers four months ago. I greatly enjoyed my time with the two desktop speakers while they worked. I consider myself fairly technically proficient, I use a mechanical keyboard, build my own computers and love to read and learn about the devices in my life. That said, audio is not an area I have pursued with any major effort yet. These speakers seemed to be a way to introduce myself to higher quality audio without taking the deep audiofile dive. The listening experience the Simple Audio Listen speakers provided was exactly what I wanted; great audio quality without the fuss of DACs, amps and lots of cables. The touch interface and remote were well designed and allowed for relatively effortless interaction with the speakers. To my dismay both of the Simple Audio Listen speakers recently ceased to output audio via anything other than headphones. I plugged my Sennheiser HD 380 pro headphones into the auxiliary out port on the speakers (not for the first time). A few minutes later I unplugged the headphones and audio playback stopped. I plugged the headphone back in and audio continued but only through the headphones. They were gently used, never dropped, water damaged, played at an extreme volume or otherwise ill-maintained. They were also plugged into a surge protector that was less than one year old. Lastly, the speaker is recognized by my computer when plugged in and set as the default audio device. I gently cleaned the auxiliary out port. I went through extensive troubleshooting including using new cables, installing new bios audio and usb drivers and connecting the speakers to four different computers, two monitors and two phones. The issue remained constant even when input was switched to auxiliary in, bluetooth and usb. I contacted Corsair who own Simple Audio and handle support for the speakers. A very helpful technician confirmed that I had attempted every possible test to validate the issue was not fixable on my end. I was then informed that Corsair no longer produces or repairs these speakers. I am in the process of receiving a refund which is expected to take four to six weeks to be wired to me after I pay for the shipping of the speakers back to Corsair. Incidentally, what are they going to do with broken speakers that they no longer sell, support or repair? Even if you can find these speakers for a steep discount I would strongly advise against them. Bought the speaker at $180 bucks. For this price there is nothing to complain on the quality of these speakers. The only annoying thing for the speaker is that it will turn off itself after in-activity about an hour later. There is no way to turn off this “feature”. It becomes VERY annoying because it will turn off itself even when you are playing audio actively. Yes, that means it will turn off itself even if you are playing mp3 or watching video on Windows or you hook it up on a AV system. Stupid design eh? After many days of trial and error, I finally find a work around on this. You will need to plug the USB port to a iMac (I believe any Mac would work), and then run a cronjob to play a 23000hz mp3 file for 10 seconds every 30 mins . Basically, only a Mac machine can keep the speaker not to sleep via USB. The reason of using a 23000hz file because even when it is played, human can’t hear anything. Then, you can either use the usb port or use the aux port for audio input and the speaker will never go into sleep. Please note that plugging the USB port in Windows machine would NOT work. It will fall asleep even when there is something playing actively on Windows. So, if you have a Windows setup like I do, you will need an extra iMac to plug the USB into iMac just to keep the thing up and running and have the Windows hook up on the aux port. At least Corsair offered a refund. After buying out Simple Audio they decided to withdraw support for the Roomplayer music streamer. This means that a perfectly good piece of hardware will no longer function when you update your Operating System. After not answering the questions I posted to their Customer Support, they chose to ignore my complaint altogether. I don’t know how many Roomplayer customers they inherited but the device is now dead in the water.